I recently communicated 3 security issues in the Safari browser to Apple. Apple let me know that they will fix 1 of the issues I reported. I will not discuss the vulnerability Apple has promised to fix until they release the fix because it is a high risk issue affecting Safari on OSX and Windows. ...since you do not consider issue 1 and 2 to be security related, I will feel free to discuss my thoughts within the information security community. Just let me know if you would like me to wait for some amount of time before I do this. Response from Apple: We understand if you want to discuss these in the security community. Before I get to the details, I want to make it extremely clear that the Apple security team has been a pleasure to communicate with. I sent them a couple of emails asking for clarifications, and they responded quickly and courteously every time. I want to publicly acknowledge that I appreciate this very much. 1. Safari Carpet Bomb. 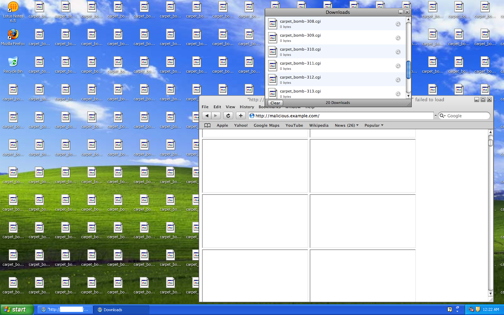 It is possible for a rogue website to litter the user's Desktop (Windows) or Downloads directory (~/Downloads/ in OSX). This can happen because the Safari browser cannot be configured to obtain the user's permission before it downloads a resource. Safari downloads the resource without the user's consent and places it in a default location (unless changed). The implication of this is obvious: Malware downloaded to the user's desktop without the user's consent. ...the ability to have a preference to "Ask me before downloading anything" is a good suggestion. We can file that as an enhancement request for the Safari team. Please note that we are not treating this as a security issue, but a further measure to raise the bar against unwanted downloads. This will require a review with the Human Interface team. We want to set your expectations that this could take quite a while, if it ever gets incorporated. [credit to BK have-it-your-way Rios for suggesting the term "Carpet Bomb" to describe this issue]. ...we have been investigating the potential for a "safe" mode for local HTML. This is an area that requires a fairly deep investigation to address compatibility issues, and to determine the proper operation. Please understand that when we label this as a security hardening measure, we are not discounting the benefits that this could have. 3. [Undisclosed]. The third issue I reported to Apple is a high risk vulnerability in Safari that can be used to remotely steal local files from the user's file system. Apple responded positively and let me know that they are actively working to resolve the issue and issue a patch. I will post an update if I hear back from them. I'd like to thank the Apple security team for their timely responses and for letting me discuss these issues with the security community.